The Honda CX500 is a motorcycle produced by Honda from 1978 to 1979. First introduced in 1978, the Honda CX500 broke all the norms the company was known to follow. While V-twins were nothing new, Moto Guzzi had been making transversely mounted shaft driven engines(which in theory should save power since it has to change directions less) for many years, but this Honda was quite different. Not only was the 500 cc OHV engine water cooled, but it had four valves per cylinder that were driven by pushrods rather than more conventional overhead cam/cam chain combinations. 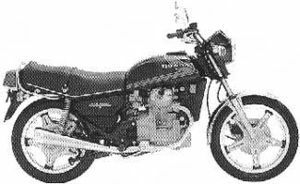 Honda derived many other bikes from the CX500 including the following: Custom, Deluxe, Turbo, and Silver Wing. The Honda CX500'78 was sold in 1978. Two colors were available: Black and Candy Presto Red. The Fuel tank stripe was red with white pinstripes. The "CX500" side cover emblem was chrome with red accent. The bike had silver comstar wheels. The control levers were silver. The master cylinder was round. The engine was a 496cc OHV liquid-cooled V-Twin with a 5-speed transmission and shaft drive. The serial number began CX500-2000001. This page was last edited on 5 December 2010, at 17:10.